On the international jury for the 2012 William Kapell International Piano Competition is an unexpected member, Richard Egarr. The British historically informed performance (HIP) specialist is known for his careful scholarship, pursuit of rare historical instruments (including surviving instruments once played by important composers or performers), and facility in playing them -- organ, harpsichord, pianoforte, and others. (This was his third appearance at the Clarice Smith Center, and we have heard them all.) Still it was surprising to see his name on the jury of a major piano competition, a realm where the pianos are grand and the music of Bach is regarded as the ancient limit of music history. In the competition’s preliminary round, most competitors played a piece from the 18th century, and there was plenty of evidence in the playing that young musicians, even those gearing up for major competitions, are aware of the influence of the HIP movement and listen to recordings made on original instruments. This has appeared true to me for some time, but Egarr’s presence on the jury seemed to formalize it. At the end of the semifinal round, Egarr agreed to give a recital-seminar on a fortepiano, on Thursday night. If the conservatory world is coming to grips with the HIP movement -- jury chairman Santiago Rodriguez was in the audience -- listeners are not always in step. More than one Kapell regular who has attended almost every performance told me that they had no interest in hearing a pianoforte, and indeed the audience in the small recital was the sparsest it has been for any of these feature recitals. This was doubly sad, because grand piano aficionados should have their universes expanded beyond the historical continuum between Mozart and Rachmaninoff, and because Egarr, who spoke with considerable charm about the sort of historical information he uses to guide him in his performances (touching on types of instruments used by the composers he was playing, temperament and tuning -- including the infamous affair of the squiggle -- articulation, embellishment), presented the HIP process knowledgeably but without any hint of snobbish orthodoxy. If he had been obsessed with historical correctness, Egarr observed, he would have had to use at least four different instruments, but he played on only one, a Thomas and Barbara Wolf fortepiano, modeled on a Johann Schantz instrument from Austria. In fact, keyboard technology was advancing at a dizzying pace in the 18th and 19th centuries -- Egarr likened it to advances in computer technology today -- and most composers had access over their lifetimes to several different instruments, and most would have been happy to perform music on any of them and take advantage of whatever advances in sound and control they could. 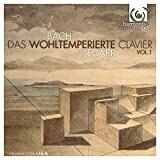 Egarr began with the first prelude and fugue from Bach’s Well-Tempered Clavier, explaining that Bach wrote at one point that he often played the now-famous prelude by leaving out the second half of each measure, that is, playing only one iteration of each arpeggiated chord. Egarr also played the fugue’s subject with a straight rhythm (eighth-note followed by two sixteenths, instead of the dotted pattern usually heard). This, he explained, was what manuscript evidence showed was the rhythm first written down: much later, someone carefully went through the manuscript adding dots and extra beams. In demonstrating the instrument, which had a pedal to control the damper mechanism and a moderator pedal (which vastly softens the possible attack on the string), Egarr explained how knowledge of the instruments composers knew can help performers understand some of the effects they were going for in their music. This came across in two Mozart pieces, the K. 511 rondo and K. 475 fantasia (the former from Egarr's fine Mozart recording), and in the prodigious decorations of the first movement, a major-minor double variation set, of Haydn's G major sonata (Hob. XVI:40). The most interesting discovery of the program, however, was two pieces by Jan Ladislav Dussek, a Czech forerunner of the Romantic style who died 200 years ago this past March. The Sufferings of the Queen of France, a dramatic homage to his one-time patron, Marie Antoinette, composed in 1793, showed the sharp contrasts of loud and soft and harmonic twists we more usually associate with Beethoven. The Fantasia and Fugue in F Minor was even more harmonically complex and showed Dussek to be perhaps the most accomplished contrapuntist of his age. In all, Egarr played with remarkable facility in his fingers, achieving a broad range of color and sound from the much smaller instrument. Glimmerglass: Let's Put on a Show!